What's not to love about Camellia flowers? They are beautiful, can bloom in the winter, and have a really long growing season. Plus, they come in many different shapes, sizes, and colors! In our "The Camellia Flower and Its 6 Delightful Shapes" we'll teach you about the many shapes, or forms, that Camellia can come in. This episode is meant for any level of gardener who wants to learn more about the Camellia plants in their garden. Also, if you want to learn more about the Camellia plant care in general, including its characteristics, colors, maintenance, and history, read our Camellia: A Gardener's Guide and Plant Profile. The fact that Camellia can come in so many different varieties should be reason enough to plant them in your garden. That they come in an abundance of colors as well is just a bonus. You could plant several different varieties of Camellia flowers in your garden and have continuous color from fall to spring! The most common Camellia is the japonica species with all its different cultivars, flower forms, and colors of flowers and leaves to choose from. The species Camellia sinensis, specifically the varieties sinensis and assamica which are the main source for Camellia leaf tea around the world! Today's topic is The Camellia Flower and Its 6 Shapes! The Camellia tree or shrub is pretty well known throughout the world and has a long history, but do you know the 6 different flower shapes of the Camellia, or forms, as they are referred to in the plant industry? C. japonica 'Pink Perfection' Click the link to purchase on Amazon! So many flowers to choose from! Camellias are amazing plants that make a great impact today in our landscapes and in the tea you drink! Be sure to check out our other DIY episodes on the Camellia plant and don't miss our post "Camellia: A Gardener's Guide and Plant Profile." Listen to this podcast for more about each of these specific shapes and how they differ from each other. 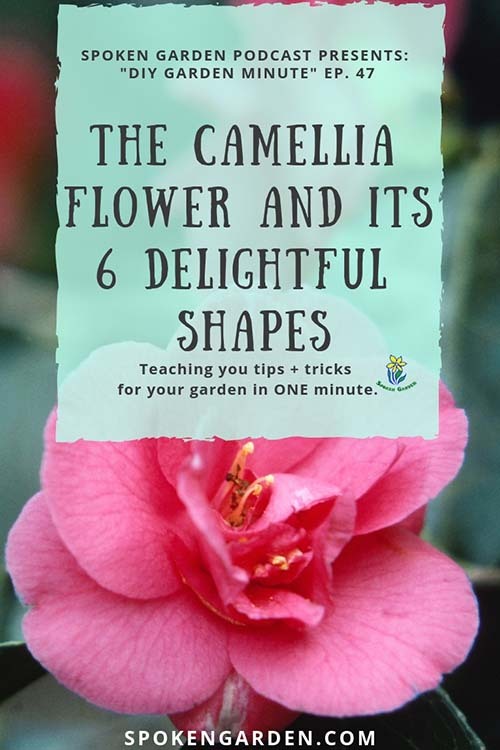 Click the graphic above to save "the Camellia Flower and Its 6 Delightful Shapes" to Pinterest for later! Learn how Camellia flowers vary in their shape and size. How each shape differs from one another.